After almost a week since arriving and saying farewell to the benthic (sea floor) scientists from DY021, the RRS Discovery sailed out of Southampton just after lunchtime on the 1st April on the second of this year’s Shelf Sea Biogeochemistry cruises. This cruise has a slightly different flavour to the last one – our focus is on the organisms living in the upper water column (pelagic), not in or around the bottom sediments. We hope to sample the plankton, tiny marine organisms that live in the water column, during one of the key periods in the seasonal diary of life in the ocean: the spring bloom. During spring, as temperatures get warmer and days get longer, phytoplankton, the tiny plants that form the base of the marine food chain have a growth spurt. This rapid increase in biomass provides a ready meal for the myriad of grazers present, and in this way the spring bloom fuels the food chain up to fish and beyond. To fuel this rapid growth, nutrients are required and the spring bloom rapidly diminishes the nutrient levels that have been present through the cold and dark winter. 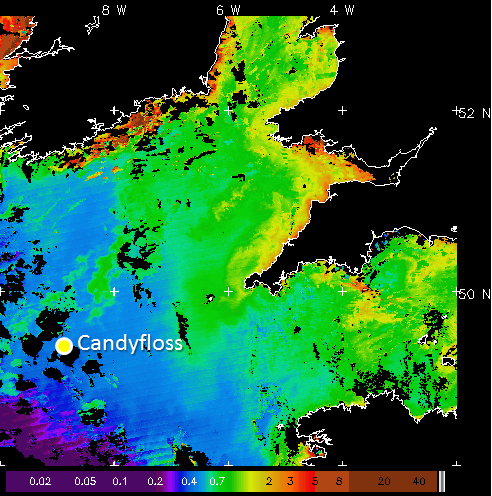 Picture 1 : The position of the Candyfloss site is shown on top of a satellite image (courtesy of NEODAAS) of chlorophyll (a pigment used for photosynthesis by marine plants, or phytoplankton) from late March. Colour changes from deep purple to green and yellow are indicative of increasing biomass of phytoplankton. Eventually patches of red will appear indicating that the spring bloom is well underway. Across the four weeks of this cruise we will travel to various sites within the Celtic Sea in order to build up a time-series of observations of the spring bloom as it happens, in terms of how it changes the water chemistry, how its biological components (bacteria, plants and animals) interact with one another, and how the physical environment of a shelf sea influences its formation and structure. To do all this work takes a huge team of scientists and technicians, and a top of the range research ship manned by skilled and experienced crew. Onboard we have 30 scientists and technicians, from nine different research institutes and universities across the UK. 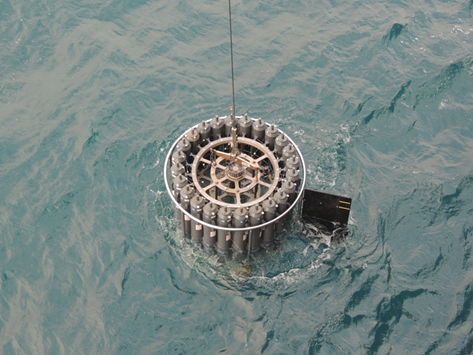 Picture 2 : One of the key sampling instruments for the cruise – a CTD (Conductivity-Temperature-Depth) probe with large grey bottles attached for collecting sea water returning to the surface with the first of our samples. (Picture by Jose Lozano). ince sailing from Southampton on the 1st April we have been making our way out to one of our key sites for the next few weeks: ‘CANDYFLOSS’ or the ‘Central Celtic Sea’ (Picture 1). This evening we briefly stopped to test some of the sampling equipment we use to collect water – a CTD (oceanographic instrument used to determine the conductivity, temperature, and depth of the ocean, see Picture 2 below). Our ETA is around lunchtime tomorrow, after a short stop at first light to pick up one of the gliders that has been monitoring conditions out here for the last few weeks. When we arrive at CANDYFLOSS, work will begin in earnest as we recover the moored instruments which we left here last November, put new batteries in them, download the data they have recorded, and plonk them back in again. As always on a ship, tomorrow is going to be a long day.